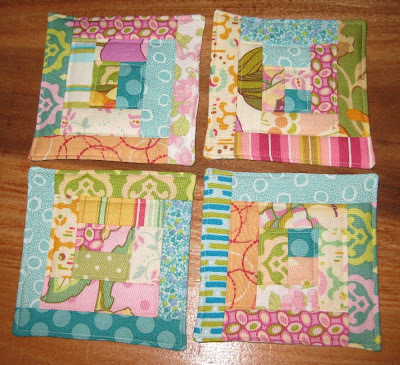 I liked the log cabin blocks I made into coasters so much that I made four more. I thought they looked great in a row, so I pieced them into a rectangular wallhanging. I added a chocolate brown binding which frames the piece. The quilting in done on the machine in a one inch grid set on the diagonal. I think it looks fresh and young. It can be yours! Check out my esty shop for more pictures. I have boys, so we don't have "doll quilts" at my house. My son did want this little quilt (12 x 16) for his bunny though. Don't laugh at the terrible meandering quilting - I made this strictly to practice on. I really like the composition of the strips though, and it makes me wonder if this design would work on larger scale for my bed. With the leftover strips from my strip quilt (I finished all 16 squares! ), I made these cute coasters. I did a log cabin style piecing, without a foundation, then sandwiched and quilted them. Love them? They're available in my etsy shop. 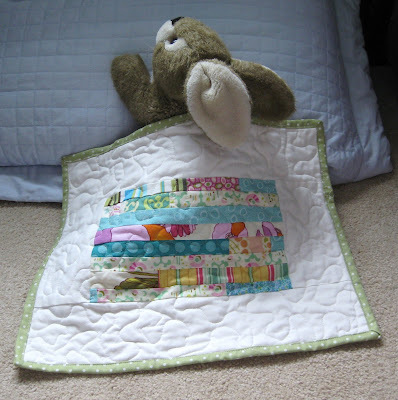 Cute Robot quilt using David Walker fabrics. Tutorial to come soon! I've got nine completed blocks now. 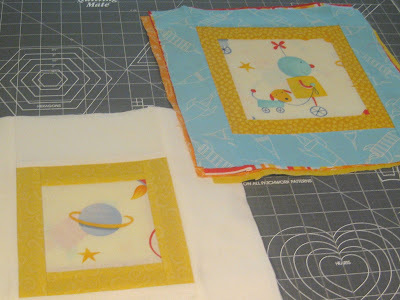 They are only 8 inches, finished size, for each square, so I'll be making at least twelve for a wallhanging/baby quilt size. 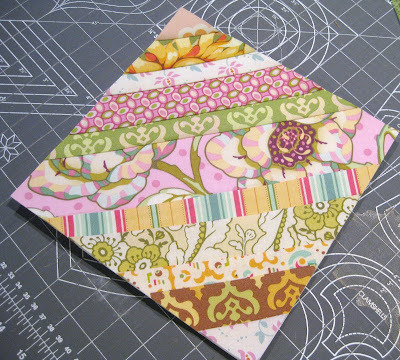 This is so different from anything I've made before - loud, bright colors, paper pieced, pattern right next to pattern. I'm having so much fun making it though! I think what I like the best is how the square within a square pattern comes out, set on the diagonal, when you put the squares together. Hey, I started on #3 on my to do list. These are all Heather Bailey Fresh Cut fabrics, but I don't have enough variety from this line for a really scrappy quilt. I'll need to augment them with scraps from my stash. 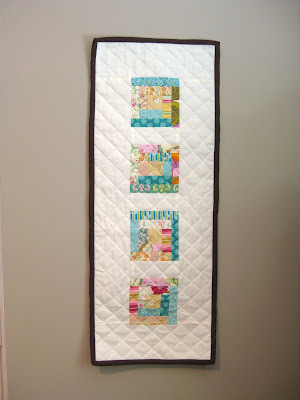 I got the idea from Two Dogs and Quilt who adapted a pattern from Heather Bailey. I modified the pattern from an 11 inch square to an 8 inch square because I wanted to use fabric from a jelly roll. A jelly roll is precut strips of fabric hat are 2 1/2 inches wide. The middle strip in each block is 2 1/2 inches; then I alternated a 1 1/4 inch wide strip (jelly roll strip cut in half) with a 1 3/4 inch wide strip. The small corners are a scrap. There are so many projects I want to do. Here's a list of my top to do's. 1. Robot quilt - in progress. I'm making up the pattern as I go a long. Look for a tutorial to come! 2. Jewel toned string quilt like this one. 3. 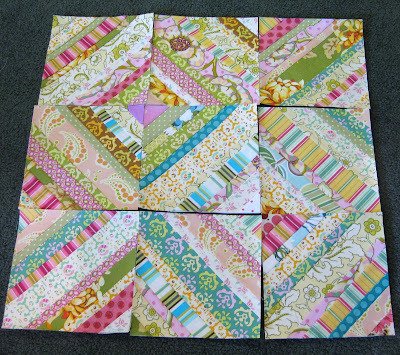 Foundation pieced diagonal square scrappy quilt like this one. 4. Quilt for my bed. I want to use red, white, brown, black and gold. The design needs to be linear and simple. I'm thinking it will be pojagi inspired but strip pieced. 5. I still haven't tried this baby booty pattern everyone raves about. 6. More monogram pillows for Christmas gifts. 7. Grocery bag dispenser for mother-in-law. 8. Edit and print out photos for family photo collage. Considering how little time I have available for sewing, this should take care of the next several years :).